Of the five entries this month, four featured winter orchids. Lorraine Badger entered a Diplodium robustum, whilst Claire Chesson, Robert and Rosalie Lawrence all entered Urochilus sangineus. Though not the winning photographs it was interesting to see the differences between the U. sangineus with one being no taller than the small Acianthus pusillus next to it and another being taller than the rapier sedge. But the winning photograph was the spring flowering Arachnorchis argocalla (White Beauty Spider Orchid) by Pauline Meyers. 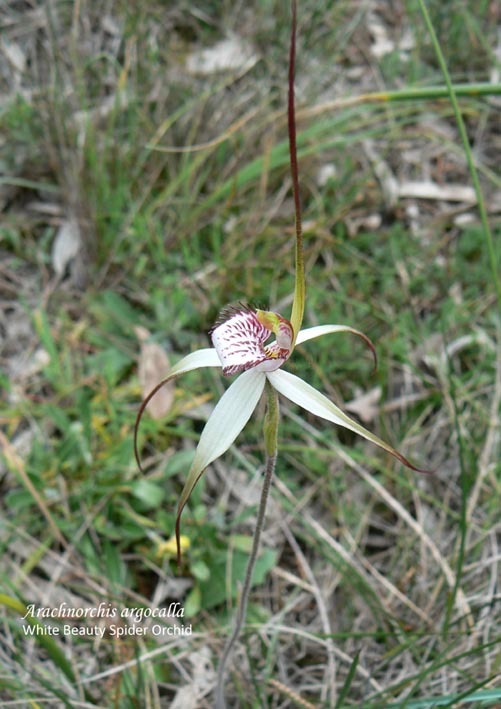 This is amongst our most threatened orchids and is dealt with in depth in the Recovery Plan For Twelve Threatened Orchids in the Lofty Block Region of South Australia 2010. 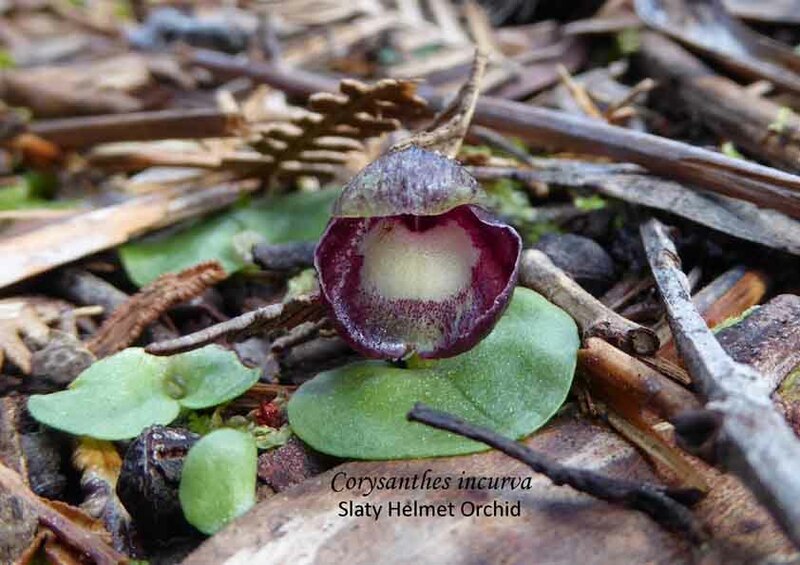 This fungi dependent endemic orchid is rated Endangered both at State and National level. Found in the Southern and Northern Lofty regions, it range has been severely reduced by possibly 80%. Since 1918 no plant has been found south of Adelaide. Flowering from September to October, it is often found in grassy woodlands often growing on gentle southerly-facing hill slopes. The soil is a clay loam with a high humus content. This beautiful orchid has one to two non-perfumed white flowers with thickened but not clubbed drooping lateral sepals and petals. The strongly recurved broad labellum is usually white, sometimes crimson, fringed with short teeth. This is one of our larger spider orchids reaching a height of 60cms. The size of the plant flower and leaf help to distinguish it from other similar appearing orchids such as A. brumalis and albino flowers of A. behrii. Like many of the spider orchids it takes 2 – 5 years to reach maturity and then has a potential reproductive life of 10 years. With an average pollination rate of less than 10%, the potential to increase the population is low and any threat to survival of the individual plants needs to taken seriously. Some threats are obvious such as weed invasion including the garden escapees such as Topped lavender (Lavandula stoechas spp. stoechas) and action is being taken to curb the spread of weeds through targeted weeding programs. Another threat is habitat loss. This has been the result of land clearing but sites are being protected either through conservation legislation or Heritage Agreements. Habitat loss can also occur indirectly and that is through Phytophthora being introduced into the sites. Although the direct effect of Phytophtora on the orchid is unknown, it is known that it can affect the plants that grow in association with this orchid. This threat can be reduced by all of us implementing good hygiene practices. These were some of the threats noted in the Recovery Plan. This plan was not just defensive, ie attempt to halt and minimalize the damage; but it was also proactive with measures outlined to increase the population. These included seed and fungi collection eventually resulting in germination and cultivation with a view to re-introduction. It is good to see that there is a plan and active steps are being taken to bring this orchid back from threat of extinction. 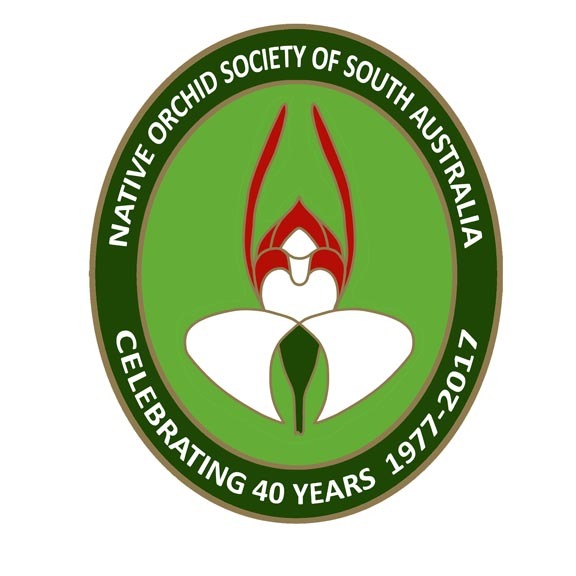 This entry was posted in Conservation, Monthly photo competition, Orchid Identification and tagged Arachnorchis, Arachnorchis argocalla, Australian orchids, Caladenia, Caladenia argocalla, Diplodium, Diplodium robustum, Greenhood, Maroonhood, Native Orchids, Orchid Identification, orchids, Photographing orchids, photography, Phytophthora, South Australia, South Australian Orchids, Terrestrial orchids, Urochilus sangineus, White Beauty Spider Orchid, Wild Orchid. Bookmark the permalink.